The Calico Shoppe is located in the heart of downtown Eau Claire, with easy access from I-94 or HWY-53. You don't want to miss a chance to visit our quilt shop. We feature many of the latest designer fabrics, and have the cutest & latest selection of patterns, books & notions. 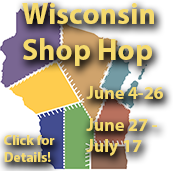 The shop has a cozy, Wisconsin feeling, with many quilt models on display to get you excited. You will find almost 5000 sq ft of store and over 3500 bolts of beautiful fabric to fall in love with. If that's not enough, our charming Purple Petunia gift shop will add to your visit with a unique selection of ladies apparel and accessories. Park, Relax & enjoy the Day Downtown! The Calico Shoppe offers FREE parking in the ramp, directly across the street, for all of our customers. The parking ramp is now automated! The process has changed, so just show us your ramp ticket, and we will give you a free payment ticket! We offer Classes, Clubs, and BOMs to feed the quilting addiction. Also, whether you live nearby, or far away, our Retreats & Bus trips can work for you! We have a Children's Museum next door, a great Farmers Market in season, & many specialty stores, restaurants, and coffee shops, all within walking distance. Put a stop in Eau Claire on your to-do list today, you won't be disappointed! We are entering a new year of fabulous QUILTING opportunities! More wonderful patterns, terrific books, and of course, exciting new fabric collections to inspire our creativity! Some of the new collections that have already arrived are Farm Girl Vintage by Lori Holt, Dandi Annie, Sunnyside Up, and gorgeous Spotted More Paper kits from Moda. Stop in The Calico Shoppe soon to see these collections and many more. We also want to THANK YOU for your continued support and friendship over the past 26 years, and look forward to 2019! Want to spend time helping other quilters? We are looking for you to join our staff!